"No one can survive becoming a legend." This Western movie, filmed in black and white incorporates many classic Western elements, as well as adding a few of it's own. The story begins with an accountant named Blake on a train West to a job he has been promised as a bookkeeper in a town called Machine. He is warned against taking the job while on his trip, and upon his arrival he discovers that the job has been given to someone else and the owner of the company orders him out at the end of a gun. He then meets a woman, and goes to her home since he is without a job or money. Once there, he is accosted by her boyfriend and is shot, along with the woman. He manages to get her gun and shoots the boyfriend, killing him. He then escapes the town on a stolen horse despite being injured badly. This results in the company owner sending three gunmen out to get the horse back, and avenge his dead son. 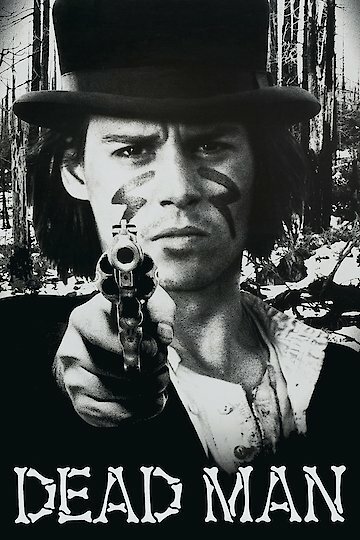 The film then cuts to Blake, waking to a Native American trying to remove the bullet that is in his chest. The Native American informs Blake the bullet is close to the heart and it will be too dangerous to get it out. He introduces himself as Nobody and he will take him to the Pacific Ocean to continue his journey. As they travel, Blake realizes that he is a dead man walking around, since at any time the bullet in his chest could pierce his heart and kill him. As the pair travel, they are forced to kill and get a higher and higher bounty for their capture or killing. They encounter wanted posters along the way and those who would try to cash in on them. They learn about each other on the journey, with Blake finding out about Nobody being taken to Europe as a novelty, and then being returned to a people who would no longer accept him. Nobody decides at one point to leave Blake alone in the forest to have a vision quest, during which time he kills two federal marshals hunting him. He also finds a dead fawn the marshals have killed, and paints his face with it's blood. He has visions and then rejoins Nobody to continue their journey. They arrive at a trading post and are recognized and a shoot out results in the pair surviving and moving on rapidly. Blake is shot again later on, resulting in a serious injury from which he passes out. Nobody takes him to a nearby Native American tribe and talks them into giving him a canoe so he can give Blake a proper death journey out to sea. Blake wakes in a canoe in ceremonial funeral clothing drifting away from shore. He looks out to see Nobody being attacked by the bounty hunter the company owner set on them, and the two shoot each other. Blake then closes his eyes, and dies as he drifts out to sea. Dead Man is currently available to watch and stream, buy on demand at Amazon, Google Play, iTunes, YouTube VOD online.